The ATCA is one of the only means available to foreign nationals who seek justice for human rights abuses by American corporations, or corporations who do business in the United States. It has been used previously in the Kano trovafloxacin trial litigation, in which Nigerian families sued Pfizer for the deaths of their children after Pfizer used the children as test subjects in a pharmaceutical trial. If you’ve seen The Constant Gardener, and didn’t realize that it was based on a true story, have a look at Abdullahi v. Pfizer, Inc.
Untie Our Hands spokesperson Carson Boyd says this outdated law needs to be removed to promote healthy economic recovery. “Because we work in volatile countries like Nigeria, Burma and Papua New Guinea, human rights advocates get us confused with the corrupt dictatorships we’re forced to cooperate with,” says Mr. Boyd. In Shell’s case, tortures and extrajudicial killings were sanctioned by military dictator Sani Abacha; Shell is merely alleged to have provided paramilitary funding. 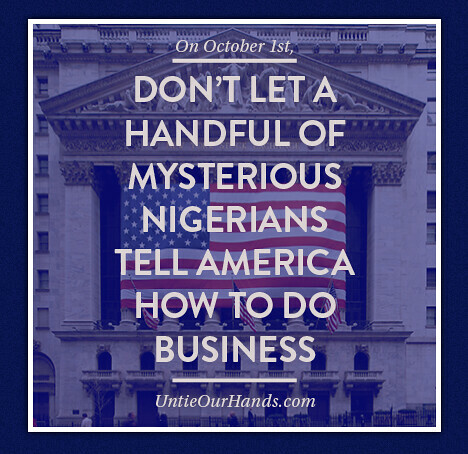 Untie Our Hands asks that American enterprise be free from this archaic legal provision, allowing them the liberty to do business abroad without fear of reprisal in the American justice system. More details on the campaign can be found on the Sum of Us web site, where the human rights abuses behind the case are explained in more detail: “In the name of profit and quashing dissent, Shell sanctioned extrajudicial killing, torture, crimes against humanity, and the murder of outspoken author and playwright Ken Saro-Wiwa in Nigeria.” Additional details are available from the International Human Rights Clinic at Harvard.